What is the Purpose of the International Barcode of Life Project? Life is threatened with a mass extinction event rivaling any in earth history. Life provides critical ecosystem services, such as pollination, nutrient recycling, food and forest products. Life causes major economic losses linked to pests and diseases of crops, livestock and humanity. Life creates complex molecules, such as antibiotics and enzymes, with tremendous economic and societal benefit. Life is largely unknown despite nearly three centuries of scientific endeavour. Although its importance is undeniable, biodiversity science has never received the major investments required to develop either a comprehensive inventory of life or advanced biosurveillance capacity. Now hundreds of scientists at major international research facilities, are reversing this situation by activating the International Barcode of Life Project (iBOL). iBOL uses sequence diversity in short, standardized gene regions -- DNA barcodes -- as a tool for identifying known species and discovering new ones. By reinforcing traditional taxonomy, DNA barcoding is revolutionizing our capacity to know and monitor biodiversity. iBOL's main mission is extending the geographic and taxonomic coverage of the barcode reference library -- Barcode of Life Data Systems (BOLD) -- storing the resulting barcode records, providing community access to the knowledge they represent and creating new devices to ensure global access to this information. That includes a hand-held device that will provide real-time access to identifications by anyone in any setting. iBOL researchers will also work on applying DNA barcoding to real world problems, such as forensics, conservation, marketplace regulation, control of diseases and ecosystem monitoring. Within five years, iBOL participants will gather DNA barcode records from five million specimens, representing at least 500,000 species. This will produce an excellent identification system for economically, socially or environmentally important species and a solid foundation for subsequent work on barcode reference library for all life. Once implemented, this DNA-based identification system will exert broad impacts on all areas in which society interacts with biodiversity - pest and disease control, food production and safety, resource management, conservation, research, education, and recreation. The economic benefits of improved biosurveillance will be large. Increasing globalization of trade and climate change means that all jurisdictions face unprecedented exposure to invasive species that threaten their agriculture, forestry and fisheries. DNA barcoding will enable the rapid identification of invasive species, allowing quarantine and eradication efforts to begin far earlier, with massive reductions in cost and increased chances of success. It will further aid the selection of optimal control strategies for pest/disease agents impacting all natural resource sectors. Barcoding will play a critical role in regulating trade in endangered or protected species and products. As massively parallel sequencing technologies become more available, the barcode library will enable sophisticated environmental monitoring that uses living organisms as integrators of environmental change and as early warnings of damage. Large-scale, automated monitoring of species presence and abundance in the world's oceans, inland waters, agro-ecosystems, and plantations will soon be routine. iBOL's work will be carried out by a research alliance spanning 26 nations with varying levels of investment and responsibilities. 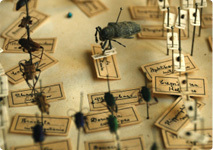 The overall task of iBOL researchers is collecting and curating specimens, gathering barcode records from them and building the informatics platform needed to store these records and to enable their use in species identification. Because Canada has led the early development of this DNA-based identification system, it will play a central role in iBOL. Research involvements will span the nation, but the Biodiversity Institute of Ontario (BIO) and its staff of 100 genomicists, informaticians and taxonomists will be iBOL's scientific hub, operating its high-volume sequencing facility, maintaining its central informatics platform and hosting its largest scientific team.